I Agreed that image is not clear .Sorry, I just forgot to update my answer. 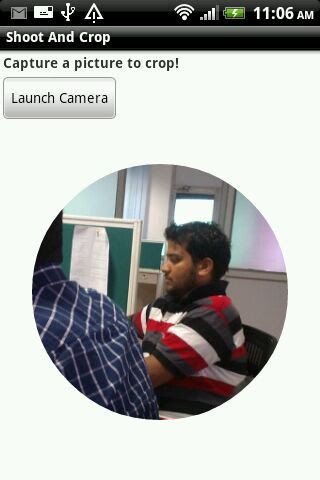 Hey Mukesh what a great code. Thanks a lot. Mukesh I need one more help if you can, I want to add 3dp round border with that. So could you please help me that How can I do it? I have done with your above example but need to give border as well. And in my layout(xml) where I am using the imageview to show the rounded image with 3 dp border,I just set the backround from drawable. Let me know its helps you or not?? hey thanks for reply :) unfortunately I can't see you code. can I have it by email? I have dropped an email with the code. Hey Mukesh Good morning. I need more help from you dear. I have implemented as per you code and it's work perfectly. But Mukesh How can I give that bitmap image height and weight in DP? I want that cropped images circular shape in "80*80 DP" ... so please could you please help me? In this way you can do it in java. Thanx Gaurav, for sharing your code and I like the way you did.The another and good way to do this. Hey Mukesh Thanks for your code but i cannot see the code for adding a 3 dp border around the circle (interior).Could you please update the answer so that it can be useful for others as well. Now check the code I just added the code for adding border around the image. Hey Mukesh thanks for your quick replay.However the border visible now is a rectangular one.I needed some thing like this.If possible could you tell me how to achieve it. hello, have you tried using "Oval" in xml, how its look like ? Yes Mukesh I just replaced and checked.However after setting the image i cannot see the border i have used your above method getRoundedShape() and changed the targetWidth and targetHeight to 150 dp also tried using 50dp but still only the image is visible not the border around it. Do u have any idea Mukesh why am i encountering such a issue since my app crashes because of it? The out Of Memory error occur because of the large bitmap size, try to scale bitmap image and then crop. Great post I was looking for something similar for hours!!! can you send the example code to -misterish86@gmail.com ? Can u please update this post. My email id is shankarraopilli@gmail.com. if u don't mind can i get the source code. Really i didn't get ur post. Sure, soon I will upload the complete code. Mukesh it would have been appreciable if you could provide some code for scaling as it has been showing vm out of memory issue to many using the above code. I want to be able to zoom into the image and have the circle also increase in size, basically pinch the image, have it zoom in as well as circle. I added the above code in my application. But its not working. Can you please figure out where I am doing wrong. I am calling a function crop2 on clicking of a button. I am using your source code from git. in performcrop() function, its not entering onActivityResult() fuction. Any idea why its happening. I am using Eclipse and virtual device manager. Hey Mukesh, I have used your code and works perfectly fine. But you have fixed the height and width of target bitmap. Due to this my image is displaying small on large screen size. hey mukesh can you help me ?? i have set the image in circle and now i want to set border around the image?? hellor sir ..i m new here. Can u please update this post. My email id is okky.agung.w@gmail.com. if u don't mind can i get the source code. I tried your code to get clear image which is mention in one of your comment most probably your 1 st comment of this blog but still not getting clear image.. Will u please give solution for this?